Hey All! For today's Blogger Book Swap Link Up, we're supposed to talk about cities we love to read about. Martie over at Spunkyrella, for instance, tends to gravitate towards books set in New York City because of her love for that town. I browsed through the lists of my favorite books and realized that my tastes really go all over the place. I think I might be attracted to books that take place travelling or in multiple places rather than in specific cities. I also seem to be drawn to books where the setting doesn't necessarily matter; where it's more about the people and the changes they are going through and what they're experiencing. To keep with the theme of the Link Up though, I picked a couple books that I have loved in large part due to their settings. Here they are! I cannot say enough about this book. It's one of the best, most compelling non-fiction books out there. The descriptions of Chicago are gritty and fantastical and beautiful and you really feel like you can see, smell, and hear everything that Larson is describing. I love visiting Chicago as it is today and it was really interesting to learn about how it was then and to learn about the fair that I never knew took place there. I think I wrote those in the wrong order, but I'm too lazy to fix it. I just woke up, alright? 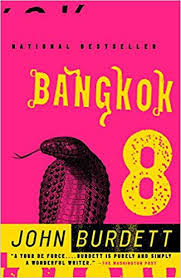 Regardless, these books are incredibly exciting, compelling, and terrifying due in much part to their setting of Bangkok. Burdett describes the surroundings in an incredibly static, frightening, and mysterious way which really sets up the feel for the entire book and its many mysteries. It makes you want to visit Bangkok....but with a really buff guide to protect you. Do you guys have a favorite setting for your books? As long as Hugh wears his Wolverine side burns, I'm in!! Oh man, it's a good book! I recommend it to everyone! 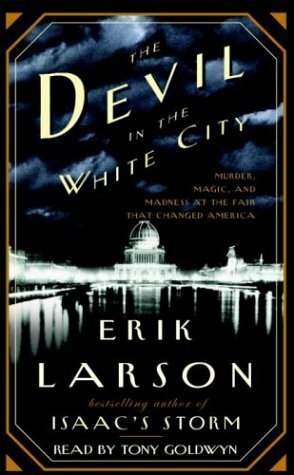 I've always wanted to read The Devil in the White City! It's been on my wishlist forever! Yay, a Chicago book! Havebt read the Bangkok series yet but they have been on my radar. I really liked the Bangkok books. You get immediately sucked in and invested and you don't want them to end. I love those kinds of series. never heard of the ones you picked but the first one sounds good. It is really good! I don't usually read non-fiction, but this one is really good. That is so random! Can we also talk about the image in my head of your Rabbi playing tennis? Love it! Devil in the White City still gives me the shivers!